Crochet Lace Fabric Printing. Custom Lace Printing. 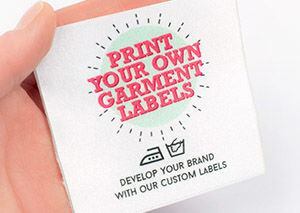 Custom lace printing is a new and exciting way to create personalized fabrics. 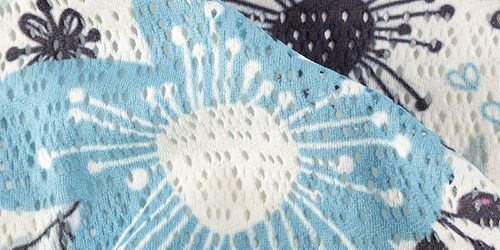 Our new crocheted lace is a stunning crochet fabric, which you can actually print on. This poly/nylon blend crochet lace fabric is super soft and is similar to knitted fabric, but instead of loops, the yarns are knotted. 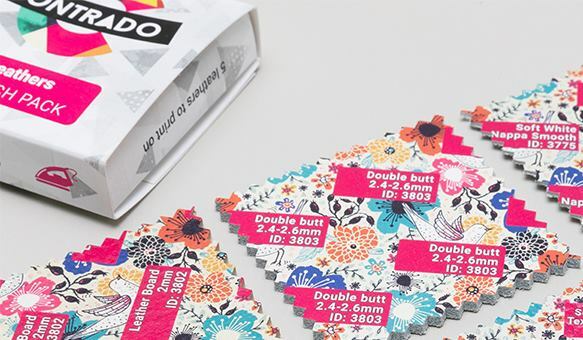 With a 60% show through to the back, our Crochet Lace is perfect for crafters and dressmakers. 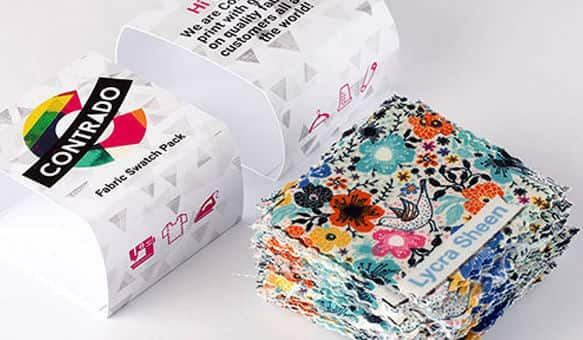 Digital crochet fabric printing is a new and exciting concept, so have fun creating something you never thought you could. 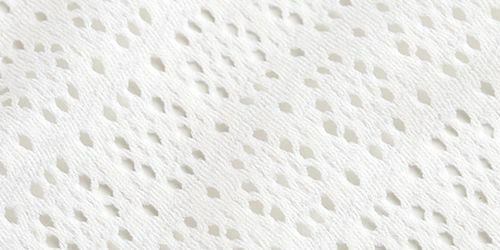 When printing on our crochet lace fabric, you can expect a super soft finish, which has very little fray. Prints look beautiful with a 60% show through to back. 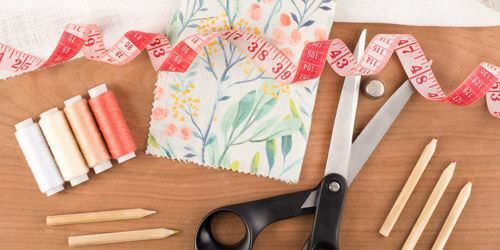 This printable lace fabric is a must-have for dressmakers, crafters, sewers and experimentalists. 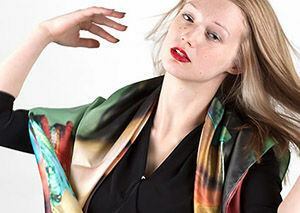 This gorgeous fabric is so soft and smooth, that you won't want to stop stroking it. 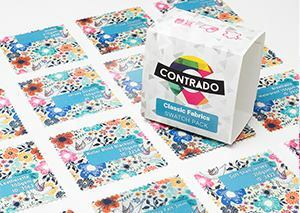 Custom lace printing is an exciting new concept at Contrado and is perfect if you are looking to design your own lace. The classic hole design is knitted into the fabric, so remember that some of the design will be lost to the holes. The base color of this custom made lace fabric is warm and matte. 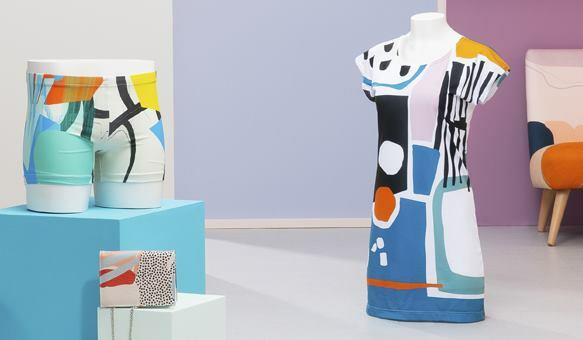 The print pattern is slightly disturbed due to the nature of the material. We don't recommend printing designs with fine lines and intricate detailing onto our tailored lace, as these will be interrupted by the eyelets. Bolder, more solid designs are preferable. This crochet fabric has a natural stretch with no elastane. It is a soft material to work with and is perfect for producing crochet lace edging and crochet lace patterns. If you want to make a crochet lace dress or crochet lace top, this works beautifully for paneling. It is also lovely for shawls and tablecloths, even custom net curtains. good company Hi there, I was so happy to find your company and my first order came out perfectly. I wish it was not folded though since it is notes to iron/steam the crease. Also it would be nice to receive promo codes with each order for the next order (which I have 6 orders waiting in my cart right now) so it encourages us. Also like free shipping over certain amounts etc. 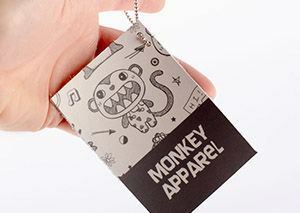 Great Design Tool, Fast Delivery Very satisfied with easy Fabric Printing design tool, & rapid delivery. Cloth I selected was excellent. Completely delighted with my order. Would this fabric be suitable for dressmaking? Our Crochet Lace is a beautiful fabric, which has a natural stretch. However, there is no elastane to bring it back to shape, once it has been stretched. This would mean that it would perhaps only work for making clothing which is naturally oversized and not fitted. It does work perfectly for creating fancy netting for skirts, paneling and mesh overlays. Does this fabric have any specific care requirements? To ensure no damage is done to your fabric, hand wash only and use delicate detergent. Dry flat with a low-heat iron with no steam. More care instructions can be provided by giving our lovely customer service team a call. What other uses are there for this crochet lace? This is a fun and unique crocheted lace, with so many varied uses. Some of our favorite uses include; paneling for dresses, skirts and tops, cute extra detailing for clothes such as cuffs, petticoats and collars. It is also great as a sporty overlay, to give sportswear a more "fashion" feel. To bring it into the home, try making tablecloths and net curtains.